The responsibilities of a Performance Analyst are evaluating the performance of an organization, make necessary recommendations so to lower the expenses and promote the revenues, prepare reports and presentations, and build relationships with prospective clients. Other essential skills for a performance analyst are problem-solving skills, analyze financial data, design and initiate organizational level changes, and communication skills essential to interact with senior management. Individuals with good analytical skills are ideal for this job. The educational qualifications required to become a performance analyst are a bachelor’s degree in any of the fields such as economics, mathematics, finance, statistics, and accounting. Possessing a Master’s degree in Business Administration or finance is an added advantage. 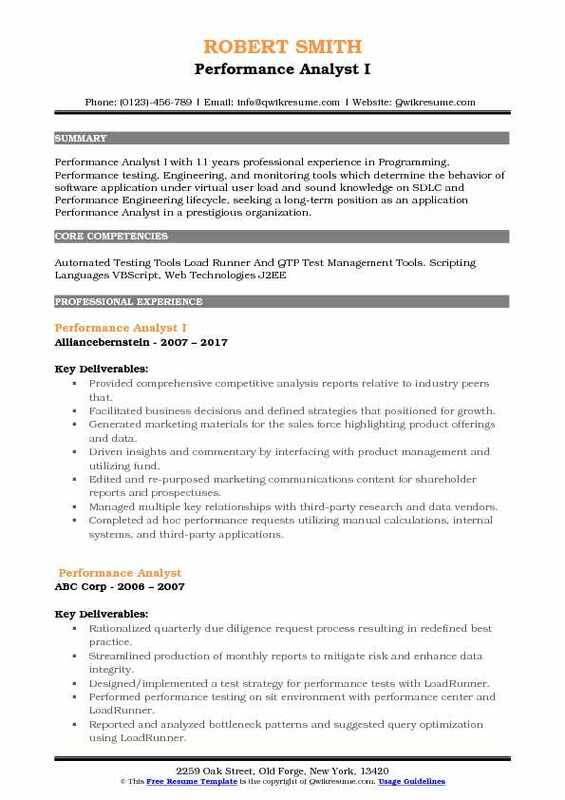 Pick a perfect Performance Analyst Resume sample and prepare yours according to the sample format. 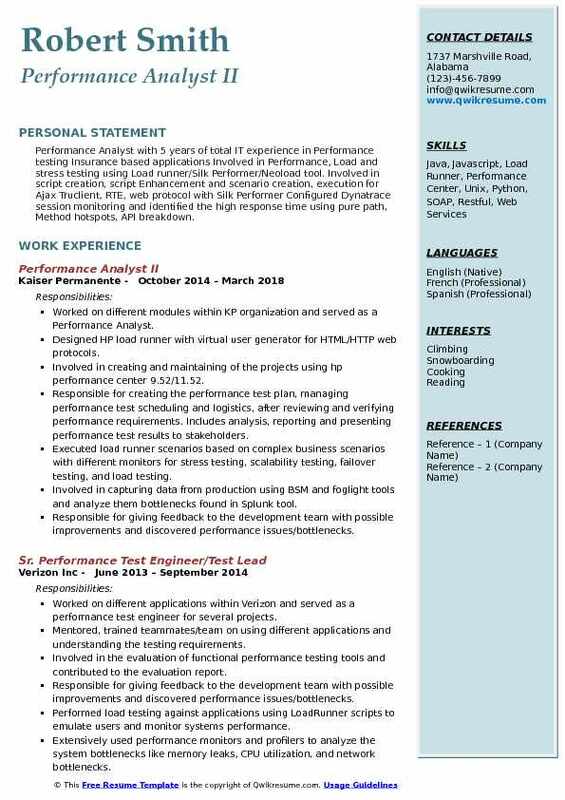 Objective : Junior Performance Analyst having over 3 years of experience in the IT field, which include Performance Analysis, Application Monitoring, Data Analysis, Capacity Planning, Performance testing (PT), Quality Assurance (QA) including automated and manual testing of functional requirements, Defect Lifecycle management and System Administration. Possessing positive orientation to expand present technical knowledge and am an active team player with a forward-looking attitude. Responsible for the development and maintenance of availability monitors in the production environment using site scope for over 90 applications including patent, trademark, enterprise applications at USPTO. Using automation framework and function libraries to leverage custom codes for multiple applications. Reviewing requirements for new monitors or any changes made to the application UI, code or functionalities for the existing monitors, testing and validating the requirements prior to the maintenance releases of the applications to ensure the automated scripts are reusable. Maintaining existing monitors to ensure the constancies against the environment related updates such as windows, browser, java, or security patches. Monitoring system resources during deployments, batch processes, migration or storage backup to ensure availability and stability of the applications during critical operations. Presenting the necessary data on resource utilization of the systems, anomalies, performance degradation, or important trends in resource behaviour in appropriate graphs and charts. Reviewing the system design documents, architecture and network diagram or technical documents for various applications to address performance and availability monitoring. Summary : Senior Performance Analyst with over 8+ years of experience in monitoring, analyzing and recommending solutions to performance problems in high-traffic, large-scale distributed systems and client-server architectures. Experienced in collecting and analyzing database performance using SQL Profiler, Activity Monitor, Experienced and good understanding of AGILE Methodology, Software Development Life Cycle (SDLC) using the Waterfall Model. Involved in performance testing of some client deliveries (SLA) for performance requirements based on capacity planning using load runner. Involved in testing server hardening and server health check with open source tools like JMeter bad boy. Developed Vugen scripts for load testing with users to find bottlenecks in the server and deadlocks in the database using load runner. Used rendezvous point to better control and generate peak load on the server thereby stressing it, and measuring its performance using load runner. Generated, analyzed, and published load runner test results and document the testing process. Worked in identifying memory leak issues, Java heap, garbage collection issues. Performed on scheduling job in both windows Unix system through task scheduler crontab. Worked in virtualization technology like Microsoft Hyper V, Oracle VMware, Citrix and VMware Workstation. Monitored the less experienced resources on the business usage of the application. Summary : Sr. 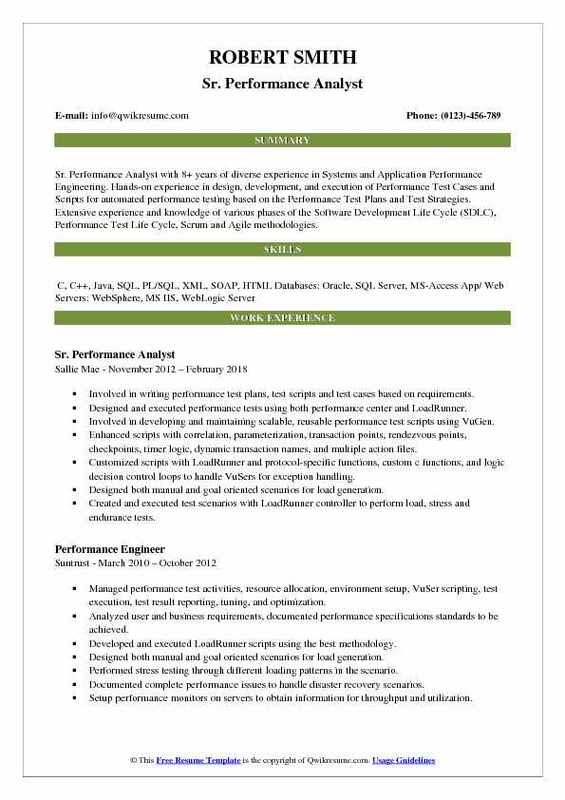 Performance Analyst with 8+ years of diverse experience in Systems and Application Performance Engineering. Hands-on experience in design, development, and execution of Performance Test Cases and Scripts for automated performance testing based on the Performance Test Plans and Test Strategies. Extensive experience and knowledge of various phases of the Software Development Life Cycle (SDLC), Performance Test Life Cycle, Scrum and Agile methodologies. Involved in writing performance test plans, test scripts and test cases based on requirements. Designed and executed performance tests using both performance center and LoadRunner. Involved in developing and maintaining scalable, reusable performance test scripts using VuGen. Enhanced scripts with correlation, parameterization, transaction points, rendezvous points, checkpoints, timer logic, dynamic transaction names, and multiple action files. Customized scripts with LoadRunner and protocol-specific functions, custom c functions, and logic decision control loops to handle VuSers for exception handling. Designed both manual and goal oriented scenarios for load generation. Created and executed test scenarios with LoadRunner controller to perform load, stress and endurance tests. Uploaded scripts, created timeslots, created scenarios and ran load tests in the controller. Monitored various graphs like throughput, hits/sec, transaction response time, windows resources (memory utilization, cpu utilization, threads) while execution from the controller. 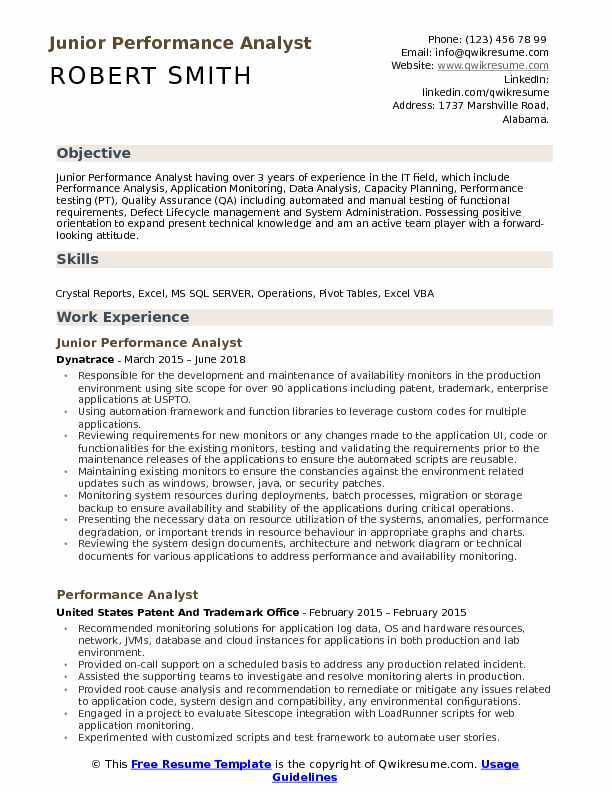 Objective : Junior Performance Analyst having extensive experience in working with various enterprise tools such as Splunk, AppDynamics, TeamQuest, SiteScope, CitraTest, OpenNMS, Introscope, IBM Pattern Modeling and Analysis tool, Eclipse MAT, LoadRunner, VMSphere Client, Rational Quality Manager, Rational Functional Tester, QuickTest Professional etc. Responsible for tracking and monitoring the progress of the project office as well as coordinate delivery dates. Tracking and updating all decisions, risks, and action items to ensure the project is on track and within the scope as well as following up with team members and management to make sure these issues were resolved. Coordinating, facilitating, and documenting various internal meetings by recording minutes, action items, and decisions using the PCAT tool. Gathering information for overall reporting on information technology projects and provide weekly. Working directly with Management and Business Analysts on the selection, the data consolidation, the data transfer from legacy systems, and the verification of accuracy. Updating the highly visible presentations such as marketing. Involving in managing onsite-offshore project team-work direction, estimation, resource management and issue resolution. Tracking the testing progress by conducting walk-through meetings with internal quality assurance and development teams. 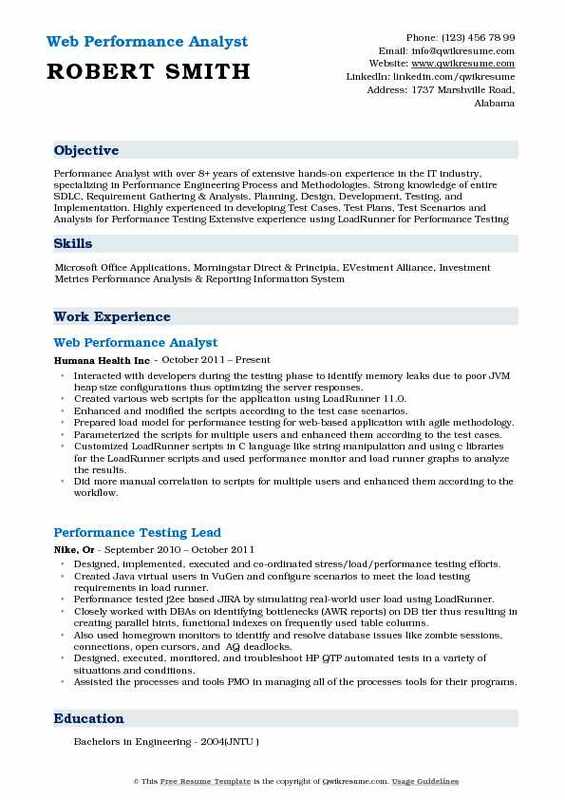 Headline : Performance Analyst with 5 years of total IT experience in Performance testing Insurance based applications Involved in Performance, Load and stress testing using Load runner/Silk Performer/Neoload tool. Involved in script creation, script Enhancement and scenario creation, execution for Ajax Truclient, RTE, web protocol with Silk Performer Configured Dynatrace session monitoring and identified the high response time using pure path, Method hotspots, API breakdown. 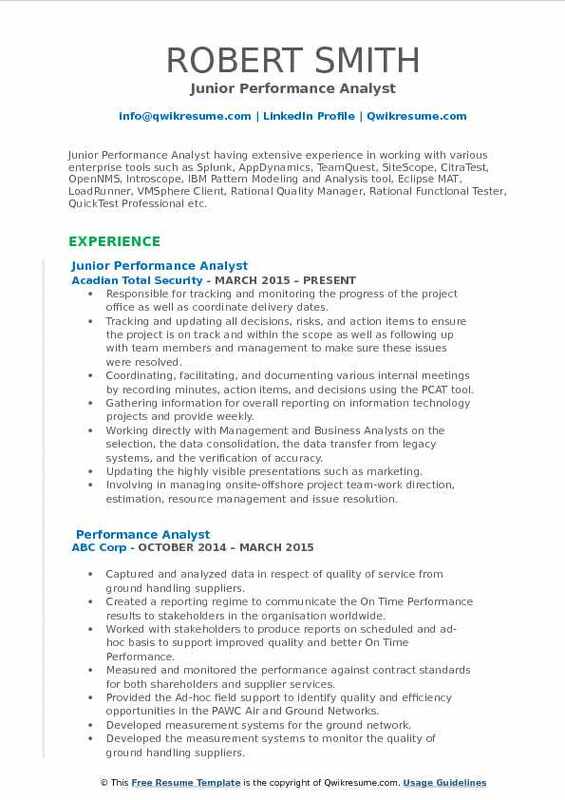 Worked on different modules within KP organization and served as a Performance Analyst. Designed HP load runner with virtual user generator for HTML/HTTP web protocols. Involved in creating and maintaining of the projects using hp performance center 9.52/11.52. Responsible for creating the performance test plan, managing performance test scheduling and logistics, after reviewing and verifying performance requirements. Includes analysis, reporting and presenting performance test results to stakeholders. Executed load runner scenarios based on complex business scenarios with different monitors for stress testing, scalability testing, failover testing, and load testing. Involved in capturing data from production using BSM and foglight tools and analyze them bottlenecks found in Splunk tool. Responsible for giving feedback to the development team with possible improvements and discovered performance issues/bottlenecks. Responsible for reviewing and verifying that performance requirements are documented and stated in measurable terms, includes reviewing architecture design, software design, and non-functional requirements documents. Interacted with developers during the testing phase to identify memory leaks due to poor JVM heap size configurations thus optimizing the server responses. Created various web scripts for the application using LoadRunner 11.0. Enhanced and modified the scripts according to the test case scenarios. Prepared load model for performance testing for web-based application with agile methodology. Parameterized the scripts for multiple users and enhanced them according to the test cases. Customized LoadRunner scripts in C language like string manipulation and using c libraries for the LoadRunner scripts and used performance monitor and load runner graphs to analyze the results. Did more manual correlation to scripts for multiple users and enhanced them according to the workflow. Worked closely with developers and system engineers to nail down the technical problems. 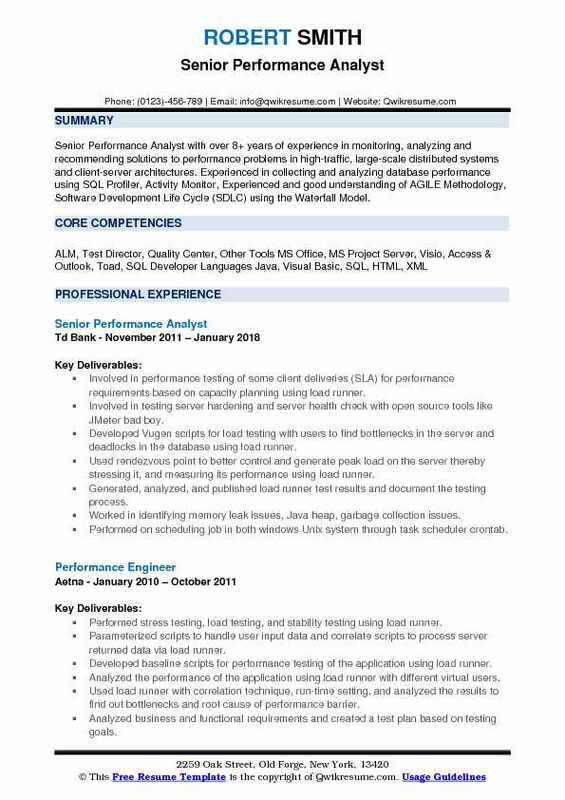 Summary : Performance Analyst with 7+ years of experience in developing and implementing testing techniques, plans, and scripts to sufficiently test the Performance and Load capacity of the System. Experienced in developing Test Plans, Test scripts & Test cases according to the requirements of the client. 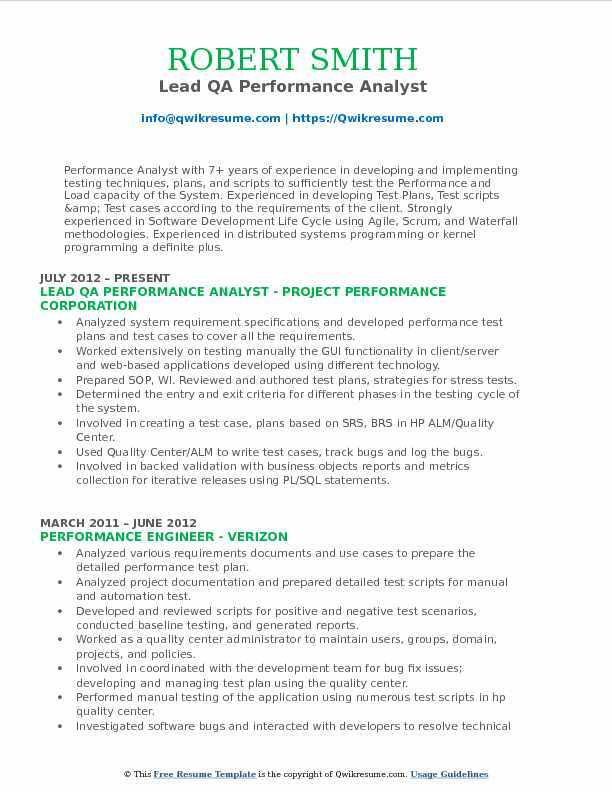 Strongly experienced in Software Development Life Cycle using Agile, Scrum, and Waterfall methodologies. Experienced in distributed systems programming or kernel programming a definite plus. Analyzed system requirement specifications and developed performance test plans and test cases to cover all the requirements. Worked extensively on testing manually the GUI functionality in client/server and web-based applications developed using different technology. Prepared SOP, WI. Reviewed and authored test plans, strategies for stress tests. Determined the entry and exit criteria for different phases in the testing cycle of the system. Involved in creating a test case, plans based on SRS, BRS in HP ALM/Quality Center. Used Quality Center/ALM to write test cases, track bugs and log the bugs. Involved in backed validation with business objects reports and metrics collection for iterative releases using PL/SQL statements. Prepared and executed test plan and test cases, for the website for performance and scalability using LoadRunner. Summary : Performance Analyst I with 11 years professional experience in Programming, Performance testing, Engineering, and monitoring tools which determine the behavior of software application under virtual user load and sound knowledge on SDLC and Performance Engineering lifecycle, seeking a long-term position as an application Performance Analyst in a prestigious organization. Provided comprehensive competitive analysis reports relative to industry peers that. Facilitated business decisions and defined strategies that positioned for growth. Generated marketing materials for the sales force highlighting product offerings and data. Driven insights and commentary by interfacing with product management and utilizing fund. Edited and re-purposed marketing communications content for shareholder reports and prospectuses. Managed multiple key relationships with third-party research and data vendors. Completed ad hoc performance requests utilizing manual calculations, internal systems, and third-party applications. Realized a 40% increase in efficiency with the marketing team and sales force, and a significant decline in ad hoc requests by collaborating with the IT department to centralize retail fund. 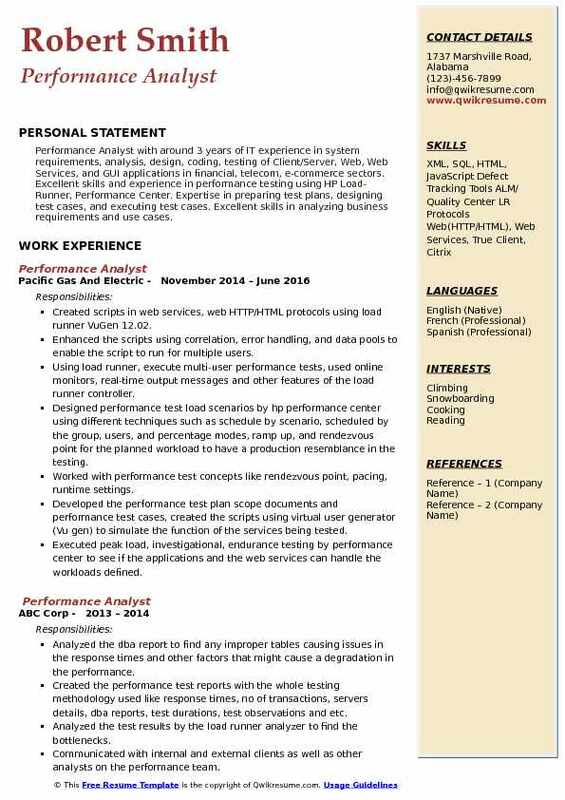 Objective : Performance Analyst with around 3 years of IT experience in system requirements, analysis, design, coding, testing of Client/Server, Web, Web Services, and GUI applications in financial, telecom, e-commerce sectors. Excellent skills and experience in performance testing using HP Load-Runner, Performance Center. Expertise in preparing test plans, designing test cases, and executing test cases. Excellent skills in analyzing business requirements and use cases. Created scripts in web services, web HTTP/HTML protocols using load runner VuGen 12.02. Enhanced the scripts using correlation, error handling, and data pools to enable the script to run for multiple users. Using load runner, execute multi-user performance tests, used online monitors, real-time output messages and other features of the load runner controller. Designed performance test load scenarios by hp performance center using different techniques such as schedule by scenario, scheduled by the group, users, and percentage modes, ramp up, and rendezvous point for the planned workload to have a production resemblance in the testing. Worked with performance test concepts like rendezvous point, pacing, runtime settings. Developed the performance test plan scope documents and performance test cases, created the scripts using virtual user generator (Vu gen) to simulate the function of the services being tested. Executed peak load, investigational, endurance testing by performance center to see if the applications and the web services can handle the workloads defined. 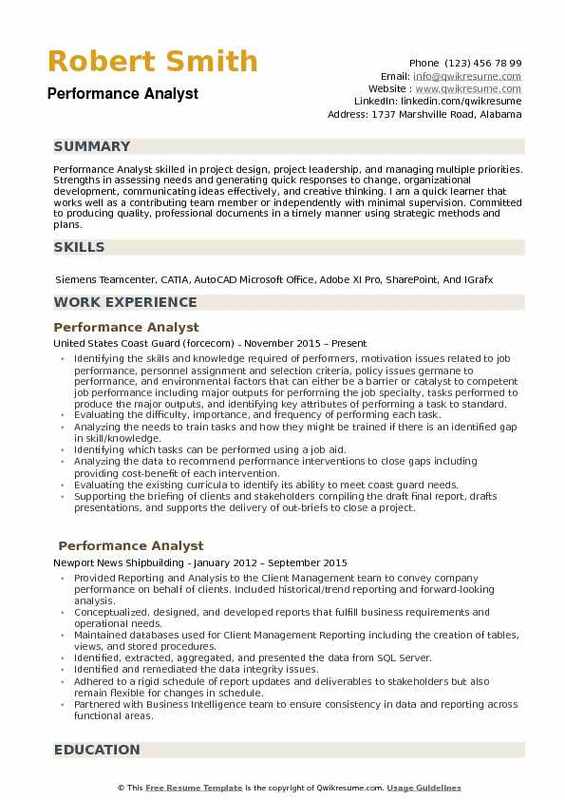 Headline : Performance Analyst skilled in project design, project leadership, and managing multiple priorities. Strengths in assessing needs and generating quick responses to change, organizational development, communicating ideas effectively, and creative thinking. I am a quick learner that works well as a contributing team member or independently with minimal supervision. Committed to producing quality, professional documents in a timely manner using strategic methods and plans. Identifying the skills and knowledge required of performers, motivation issues related to job performance, personnel assignment and selection criteria, policy issues germane to performance, and environmental factors that can either be a barrier or catalyst to competent job performance including: major outputs for performing the job specialty, tasks performed to produce the major outputs, and identifying key attributes of performing a task to standard. Evaluating the difficulty, importance, and frequency of performing each task. Analyzing the needs to train tasks and how they might be trained if there is an identified gap in skill/knowledge. Identifying which tasks can be performed using a job aid. Analyzing the data to recommend performance interventions to close gaps including providing cost-benefit of each intervention. Evaluating the existing curricula to identify its ability to meet coast guard needs. Supporting the briefing of clients and stakeholders: compiling the draft final report, drafts presentations, and supports the delivery of out-briefs to close a project.